1. Locate the silver print head (see Picture 001). Picture 001: Silver print head location. 2. Remove the silver print head from the machine (see Picture 002). It should pop out if you pull in an upwards direction (i.e. it's magnetically set in place, no screws) with a good amount of force. Picture 002: Silver print Head removed from carriage holder. 3. The pneumatics tube will still be attached (see Picture 002A), but you can place the print head gently on the build plate or other area during this operation. Alternatively, you can temporarily disengage the pneumatics hose (see Picture 003A) from the silver print head by pressing down on the valve insertion lip (see Picture 003B). You can then gently remove the pneumatics feed line (see Picture 003A) by pulling upwards to disconnect it. NOTE: If you decide to unhook the pneumatics hose to the print head, remember to reconnect it before printing silver. You do this by repressing the valve insertion lip and reinserting the hose after the capping procedure is completed. Picture 003: Pneumatic hose hookup to silver print head. A = hose B = valve lip with tube hole. A.) With your gloves still on (preferably), find the bottled solvent (see Picture 004) contained within your Voxel8 Developer's Kit box. Picture 004: The bottle of Wiping Solvent. B.) Unscrew the bottle, and the squeeze dropper to capture some solvent (see Picture 005). Picture 005: The bottle of Wiping Solvent with the eye dropper containing a small amount of solution. C.) Carefully apply only 2-3 drops of the solution onto the sponge contained in the capping mechanism (see Picture 006). Apply to both sponges on left and right sides. IMPORTANT NOTE: You should wet the sponge at least every 24 hours to keep it moist. Failure to do so may result in print anomalies. It's a good habit to always wet the sponge if it's in a shared printing environment. Picture 006: Applying the Wiping Solvent to the Silver Capping Mechanism. NOTE: This solution prevents silver from building up on the sponges. For more information on the Solvent, you can check out "Working with Silver" page, later. You should reapply solvent every 24 hours or so, or when it's bone dry. D.) Replace the silver print head back into the machine (see Picture 007), making sure that it is fully seated in the print cartridge holder. Picture 007: The silver print head is replaced back into the Voxel8 machine. E.) Make sure that the pneumatics tube is reconnected to the print head if you had temporarily disconnected it during the procedure above (see Picture 008A). Picture 008: Pneumatic hoses are all connected before printing silver. 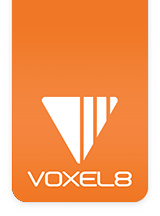 Now you're ready to load in the Voxel8 conductive silver ink.